*Product was received. Opinions are my own. This post includes my affiliate link. My toddler is super tiny for his age. Every one I meet says it and yes, I KNOW it! He eats fine, he is just tiny. Heavens, he is still rear facing in his car seat. I won’t turn him until he is ready. This high chair has a dual restraint system. The restraint can be adjusted for a 5-point harness or a 3-point harness. It has a nice water-resistant cushion that wipes clean super easily. The dishwasher-safe tray cover is nice. You just ‘pop’ it off the wood tray, when you want to clean it, then ‘pop’ it back on. 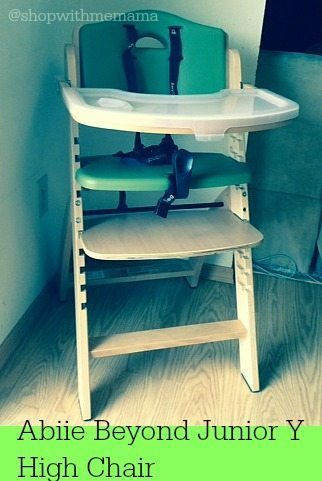 This high chair can be adjusted very easily, for your child. You simply pull out the wood foot rest and adjust it where you want it. Same with the seat. The high chair can be transformed to a toddler’s or a dinning chair for all ages. It’s economical and instantly provides an extra chair to your home when needed. The high chair feels sturdy and strong to me. It does take up a bit of room because the bottom of the high chair spans out (like most high chairs), but other than that, this is a fabulous high chair and my toddler loves being in it. Every time it is time to eat, he goes to his high chair and says “Please Put In!” LOL. So cute!!! You can purchase the Abiie Beyond Junior Y High Chair online at Amazon.com . It retails for around $249.00. One person is going to win the Abiie Beyond Junior Y High Chair! Easy! Just use the Rafflecopter form below! Good luck to everyone who enters! Contest is open to US 18+. Giveaway will end on May 13, 2015 at 12 am PST. Winner will have 48 hours to confirm their win, after I email them, or a new winner will be chosen. Sponsor is responsible for sending out prizes. I am not responsible for lost or stolen mail. What I like best about this high chair is the dishwasher-safe tray cover. I love that it grows with your child even when they’re out of the baby stage. I love the look, and love that it grows with your child! Great investment! I love that your child can’t outgrow this high chair. How cool is that! I like that it is convertible and grows with your child. I like that it converts to a regular chair. I love the dishwasher-safe tray cover. So cool the whole high chair! I like that you can use it after baby outgrows it and I like the look of it. It’s very cool. it’s so cool how it grows with the child! I’m having my first next week and I’d love this for him!! I Like that it is a chair for lifetime! I love the cool design of this chair. I like its ease of adjustability! I also love the design. I like how it is able to be used through the years. Very handy. I like that it can be used at all stages of childhood and beyond! I love the overall design of the chair. Also like the it grows with kid. I like that it looks very easy to clean and can really grow with your child. My favorite feature is that it is so versatile and can be used for so long. I like the foot rest. I love that you can adjust the wood foot rest and adjust the seat, also loving it can go from high chair to a regular chair. Love it grows with the child. I love that is basically grows with child. Ito a plus for you and the child when it’s something that can be used long term. I love the design and the 5 point harness. I like how versatile it is! I like the adjustable harness, the different color options and of course that it grows with your child. I like that its easy to clean and grows with the child. I love that it can be transformed to a toddler’s or a dinning chair for all ages! I like how easily it can be adjusted. I love the versatility of this high chair!! !